Is your current knife old and dull and pretty much useless for hunting? 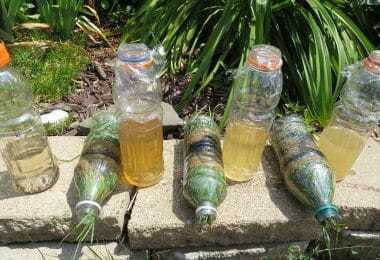 Are you considering something practical to help you with your hunting tasks? 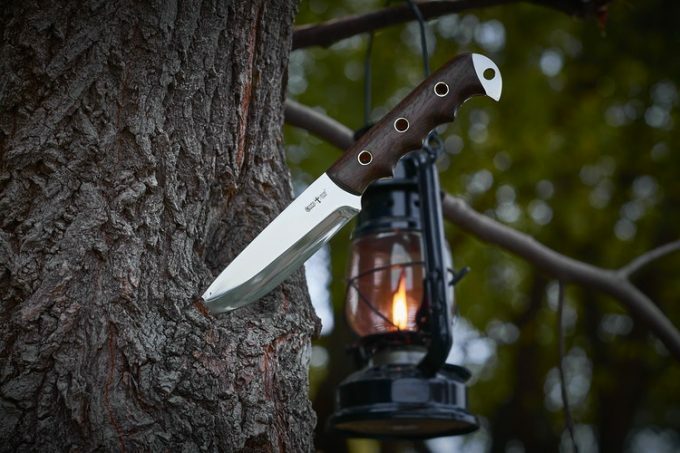 You should consider getting the best hunting knife the market has to offer. 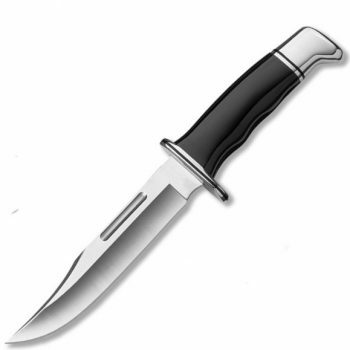 A hunting knife is without a doubt one of the most important items in your bug-out-bag, and by design, a hunting knife should be rather simple to use and maintain. But, there are all sorts of knives on the market, therefore the choice can be rather overwhelming. That is why we decided to help you out in your search. 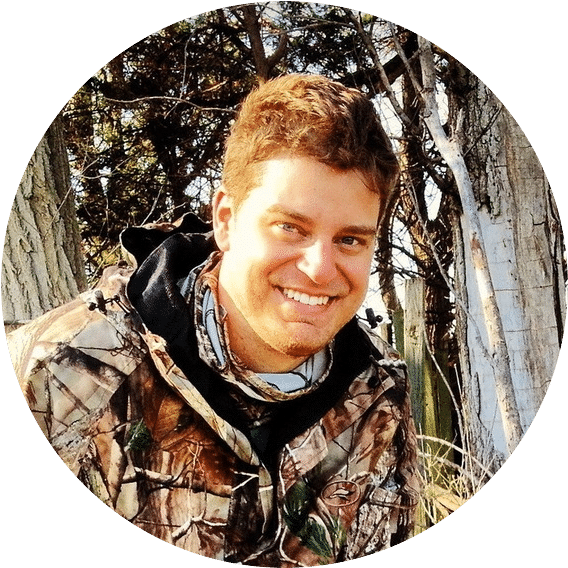 When looking for the perfect knife for hunting, there is more to knives than just being able to cut, and that includes some specific characteristics that make certain knives better for hunting, about which, we are going to talk about in this article. Also,you will have a chance to read the in-depth reviews of the finest models on the market. But first, let’s take a look at the table of the products we reviewed, so that you know what to expect. Below we will discuss what you need to know before you buy just any old hunting knife. We will give you. 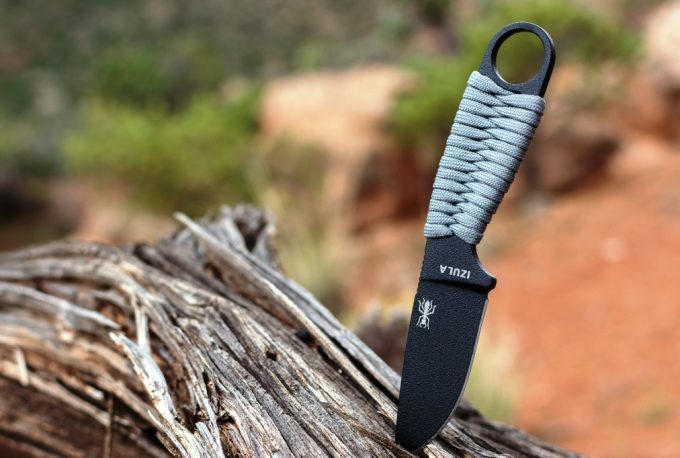 We hope this is helpful on your journey to a new hunting knife! There are two types of knives that you can choose: fixed and folding. Fixed blade knives do not fold and are forged for heavy applications, such as hunting. The extension of the edge into the handle and absence of movable parts make them stronger. They are usually safer when compared to folding blades. There are many blade shapes and styles made of different steel materials. Keep in mind that a good fixed blade doesn’t have to be big, but it has to be rugged. Folding knives have movable parts and they can be folded when not in use. However, there are a number of considerations that you must make when shopping for these knives. The very first consideration is the locking mechanism. There are several types of locking mechanism: lock back, liner lock, frame lock, axis lock, and slip joint. The most recommended locking systems for hunting is liner lock. It is the best because its strength is derived from the triangle. The best folding knives can be more convenient to carry around. However, strength is compromised at the folding point and they can easily break if used vigorously. If you must buy a folding knife for hunting, then make sure it is tactical. This simply means that the blade length should be convenient for your cutting activities and the blade material should be durable, resistant to corrosion and easy to sharpen. The handle should not be too long to the extent that it compromises balance. The drop point edge is characterized by a spine that drops progressively in a convex angle towards the tip, meeting with the bottom at a sharp point. The sharp point, offers the knife more control, and allows it to retain more strength. This design provides a strong wide tip that makes the blade less susceptible to breaking. In addition, there is a wide cutting area in the middle for slicing. The blade length is very important when shopping for the best hunting knives. You should not go for a big length that may be difficult to carry and use. The most resourceful and versatile length should range between 3 and 6 inches. 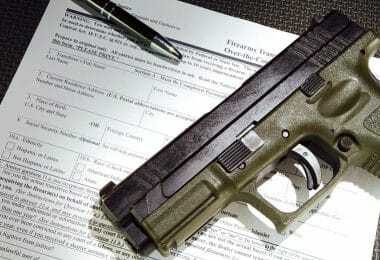 This should be comfortable and legal to carry. The blade design determines how tactical and reliable a knife can be, especially when dealing a cutting blow and penetrating blow.Cutting is simply basic to a cutting tool and depends both on the curvature of the tip and sharpness of the edge. 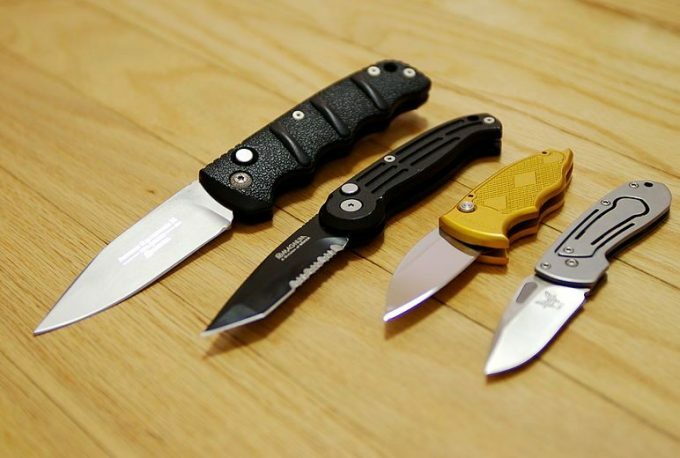 The most popular designs are: drop point, dagger type, Tanto point type, and clip point. The most recommended of the four designs is the drop point.Edge tool blades are made of different types of steel: high carbon stainless steel, stainless steel and carbon. Carbon steel is fairly soft and very easy to sharpen, but it is prone to rust and corrosion. Stainless steel blades are the hardest and somewhat difficult to sharpen. Though, they hold an edge almost forever once sharpened. They are not prone to rust and corrosion. High carbon stainless steel blades are the best of the three. This material combines the qualities of carbon steel and stainless steel. The majority of hunting, bush crafting and survival knife blades are forged from high carbon stainless steel. These blades are fairly easy to sharpen and they hold an edge for a desirable length of time. Furthermore, they do not rust easily when compared to carbon steel. Are you ready to go through the 8 reviews below? Let’s learn about the latest models on the market so you can choose what works best for your hunting needs! 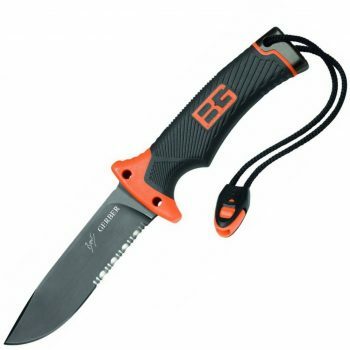 The Gerber Bear Grylls Ultimate Knife is an ultimate serrated knife designed for hunting. 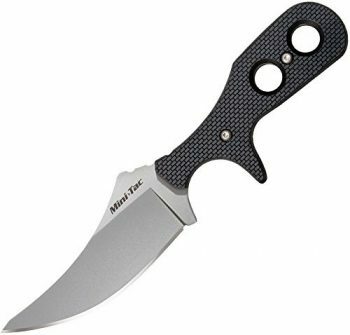 It is fitted with a drop point serrated blade that is devised from high carbon stainless. The knife’s blade is mounted to a user-friendly rubber handle. The handle is textured and has a stainless steel pommel and lashing holes. These unique features allow you to use it as a hammer. The serrations are well-sharpened and they are not easily chewed up, as long as you do not excessively abuse the edge. The straight part is sharp enough to allow you to feather as well as carve sticks with no problems at all. The handle is temperature resistant; therefore, you can comfortably handle the Gerber Bear in cold as well as wet weather conditions. The high carbon stainless steel blade material is heavy-duty, and hard-hitting for some serious cutting activity. The sheath is made of molded nylon and it only weighs 3.5 ounces. Moreover, this edge tool is integrated with a diamond sharpener and fire starter. Related: In cold weather, keep your head and fast warm with the Ergodyne N-FernoWind Resistant Hinged Balaclava. It is wind resistant, comes in a camo color to keep you hidden in the field and it offers full coverage. 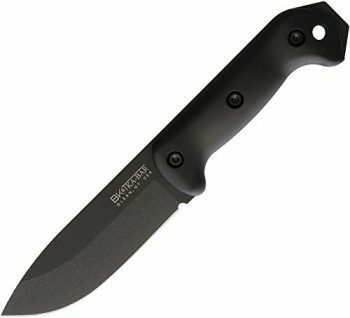 The Ka-Bar Becker BK2 Companion Knife is one of the best edge tools for hunting and bush crafting. Weighing sixteen ounces, it is lightweight and it features a heavy-duty 1095 cro-van steel blade that is perfect for hunting and bush crafting, including skinning game, splitting kindling and chopping onions. The drop shape offers a large cutting area and it provides a strong wide tip, which is not prone to breaking. The handle is forged from Grivory; this offers you a balanced grip for hunting and bush crafting. If you are in search of a small, versatile survival cutting tool, something with a blade length range of five to six inches, then you should settle for Ka-Bar Becker BK2. The edge is shaving sharp right out of the box and it will serve you in a number of cutting activities before you can sharpen it again. It comes with a heavy-duty plastic sheath, which does not only keep the blade sharp, but also safe from unnecessary damage. However, you have to handle the knife with care and do not over abuse it, in order to avoid loosening the handle nuts. Related: Keep your feet warm while hunting, with the Thick Thermal Socks 2 Pack which are great for winter time. They trap the heat and are well insulated, and they come in a 2 pack. 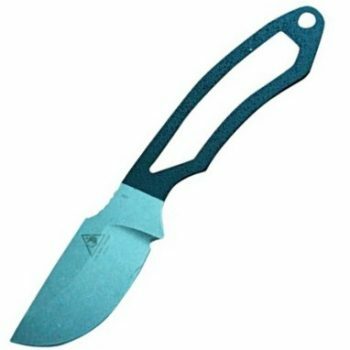 The Buck Knives 0119 Special Knife is indeed a special fixed blade edge tool for work and cutting in tight places. Its design is classic with minimal flaws. It is full tang – the blade goes all the way to the handle and into the pommel/guard. It comes, shaving sharp, right out of the box, and it is unbelievably easy to sharpen. The six-inch large clip blade is forged from 420HC steel, which offers edge retention and exceptional strength for serious cutting jobs. The blade remains durable even after constant use and it is easy to sharpen. The black phenolic handle is highly user-friendly and the integrated aluminum pommel/ guard provide the perfect handgrip. 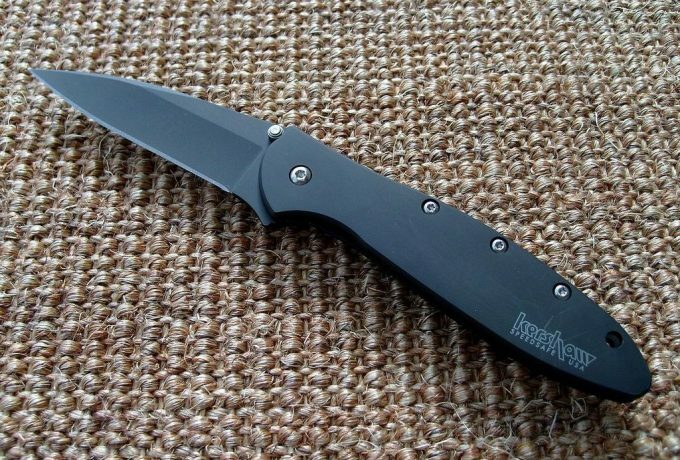 At first glance, you will realize that the Buck knives 0119 will offer you the best. The edge is resistance to corrosion and it will present no problem at all when you use it in wet conditions. The manufacturer’s attention to detail and craftsmanship is remarkable. 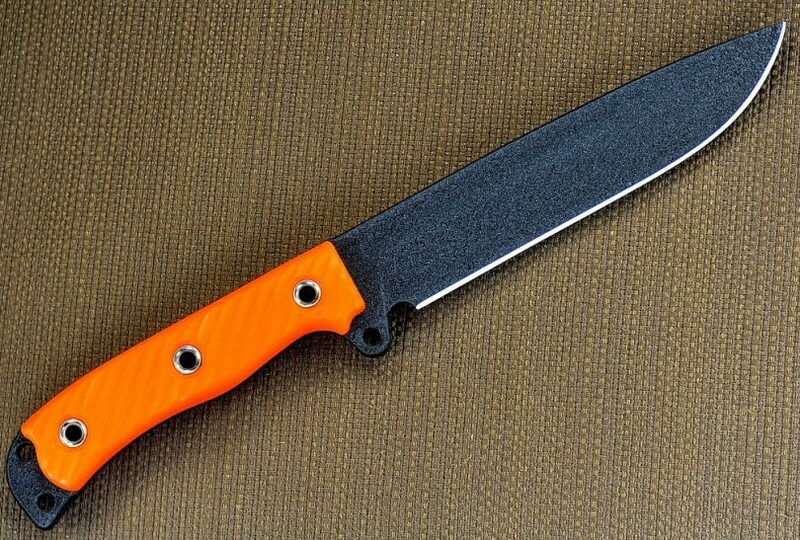 You will definitely be happy with this knife. Related: The BoneView HotPocket Hand Warmer is great when you are getting cold while waiting for a deer to come along. It’s not only a hand warmer, but it will charge your phone and it is also a flashlight. A full battery can last up to 8 hours. 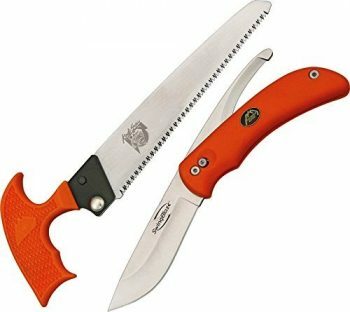 The Outdoor Edge SwingBlaze-Pak Knife/Saw Combo is a versatile and resourceful combination of skinning blade, gutting blade and Kodi-saw. The Pak is a well-thought design for a hunter and a camper. 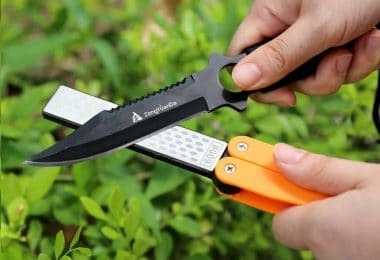 Both the skinning and gutting edges are sharp and you will admire how the tipping on the tops of the edges crosses each other when you put the gutting blade to use.You can easily change the SwingBlade from a drop-point skinner to a decisive gutting tool by simply pushing the lock button. The gutting blade cuts beneath the skin of a game without cutting the hair. The six-inch t-handle saw is fitted with a 65Mn spring-steel edge along with a triple ground tooth configuration, which provides a reliable cutting edge for slicing through wood and tough bone. The whole Pak comes fully equipped with a quality leather belt sheath for securing the blades when not in use. In addition, it is fitted with a blunt tip for preventing any unnecessary puncturing of your game’s internal organs. This makes the Outdoor Edge SwingBlaze Pak the perfect gear for game hunting. Related: The G4Free Outdoor Tactical Backpack is a great tactical bag that comes in a camo color, and is easily portable anywhere for camping, hiking and other outdoor uses. It’s affordable and comes in many colors, plus its compact and made of durable construction. The Buck 193 Alpha Hunter Knife is the premium knife for a serious big game hunter. Its ergonomic design and full tang construction make it the ideal hunting gear. This pro level edge tool is forged to be used in the most demanding cutting activities. The manufacturer has used revolutionary design and premium material along with quality craftsmanship. The edge is heavy duty characterized by a full length tang, gut-hook, 3.75 drop point, 12C27Mod Sandvik steel for tough cutting jobs.The blade is also shaving sharp, right out of the box and it is exceptionally easy to sharpen after extensive use. The drop point edge provides a wide cutting area in the middle for slicing and a strong wide tip that is not susceptible to breaking. You can use the knife to skin your game without necessarily sharpening it every now and then. The Rosewood Dymondwood handle is uniquely forged, exposing the outer parts of the steel material. The handle is ideal for small hands. Moreover, the knife comes with a quality, genuine leather sheath for storing and safeguarding the blade. Related: The Changku Emergency Survival Kit is a great kit that you can use in all outdoor situations. Affordable, this 11 in 1 kit gives you tools like a compass, flashlight, whistle, emergency blanket and more. It’s great to keep with you in case of an emergency where you may be outdoors for a length of time. 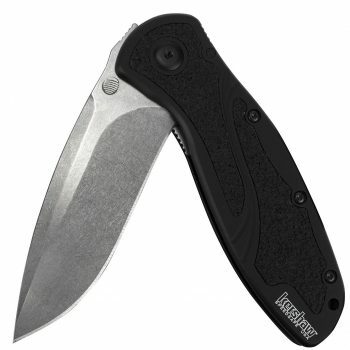 Made in the United States, the Kershaw Blur S30V Knife is a contemporary knife designed for the hunt. The very first thing that you will notice about this knife is the patented SpeedSafe opening system. This system helps you open the blade by simply applying physical pressure to the blade protrusion or thumb stud. The system is farther installed with a torsion bar for preventing gravity from opening the blade, while the integrated liner locking mechanism locks the edge open when in use. Also, the handle design has pre-drilled holes that allow you to change the knife’s position (reversible pocket clip). It has chamfered thumb studs that are scalloped and well-angled, allowing you to easily open the blade by pushing your thumb in the forward position. The blade is practically sharp right out of the box, but it will need some sharpening after some serious cutting business. Sharpening it is easy, you will need no more than twenty strokes to get it razor sharp. Also, the stonewashed finish on the handle is amazing, and when shopping for a SpeedSafe knife, you should look no further than Kershaw Blur. Related: Having the proper gear is essential outdoors. The Eglemall Men’s Outdoor Hunting Jacket is a great jacket that has a fleece lining and is waterproof. Made for tactical use, you can find this jacket in many sizes and colors. The Cold Steel Mini TAC Skinner has a unique design that distinguishes it from other skinning knives. It is unbelievably lightweight, making it highly portable. You can wear comfortably and conveniently wear it for twenty fours without even noticing that you are carrying an edge tool. This masterpiece is forged from Japanese AUS 8A stainless steel, providing it with inconceivable toughness for such a lightweight and small cutting tool. It is fitted with thin genuine black G-10 Griv-Ex style handle scales, providing it with toughness and roughness required for game skinning. It is really sharp and well-made for a neck knife, especially for campers. The grip architecture ensures that your hand doesn’t slide over the edge during use. This ability makes it the best cutting gear to use in a stressful situation. You do not have to buy a pocket knife; Cold Steel Mini TAC lightweight nature should give you more than enough reasons to buy it for camping or hunting. Related: The Eglemall Men’s Tactical Pants are great tactical hunting pants that are fleece lined and have a soft shell. While they may run small, you can choose your size and color of camo print you want. Waterproof, you won’t have to worry about the durability of these pants. The Lone Wolf Hardway Skinner Knife is the ideal plain-edged blade for skinning game. The design is particularly dedicated for outdoor cutting activities. 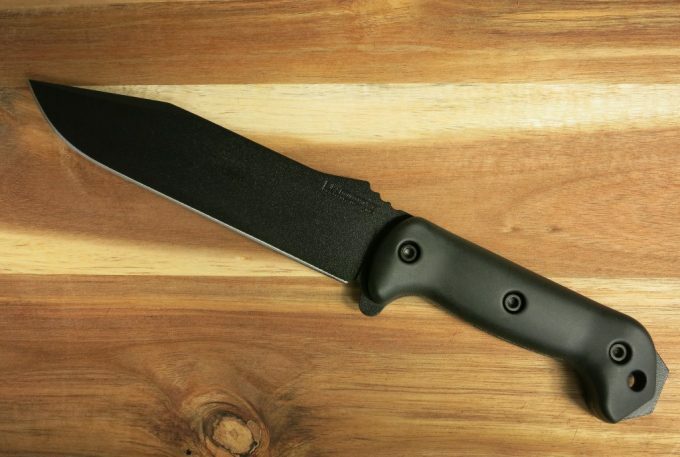 This is a full-sized fixed blade with a skinner edge. The fixed-lock system is ideal for hunting. The drop point blade gives the edge tool a lot of control, whereas retaining more strength. The blade’s belly has a wide surface for skinning and slicing. With that said, this is the ideal all-purpose edge tool to buy. 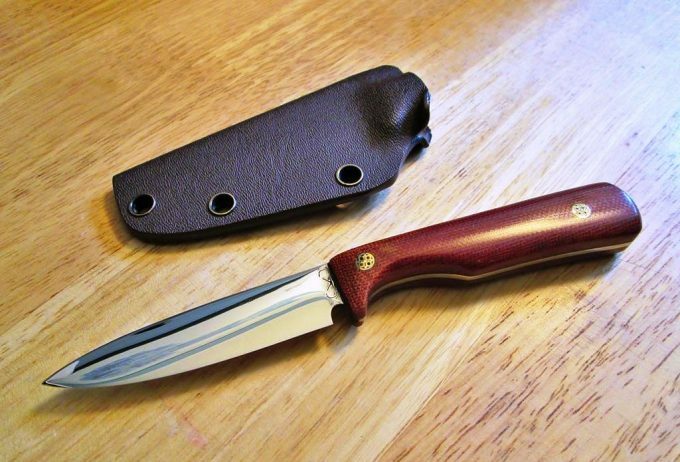 This knife has a 6.69 inch blade that is plain edged and is made for a variety of hunting uses. It has a hard way caper for back country use and can make it through any path you go on. The blade length itself is 2.52 inches, which works well in use. Overall, you have a great knife here that will meet your expectations if you are looking for something that isn’t too fancy and will get the job done right. Related: The Galwad Rechargeable Walkie Talkies are really great. They come in either a 2, 4, or 6 pack and are long range, two way radios.They are affordable and you may want to have them in case of emergency. Hunting requires a good knife, one that feels good in your hands. The products we just discussed should help you do more than just a compare the products. You should be able to choose a blade that will work best for you. You should always remember that the hardness of an edge tool varies based on the size and intended use. A tactical style blade will help you do all your cutting activities during hunting and present minimal flaws, if any. 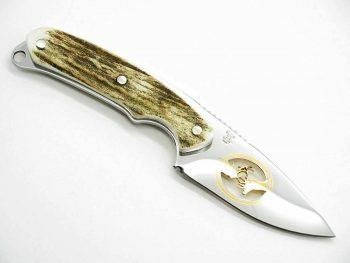 As you’ve read, the knife type and blade profile are the two most important factors when shopping for hunting blades. You are now aware of the important features and the newest knives on the market. It is time to go shopping. Are you ready now that you have all of the knowledge? Do you think we have missed any of the great hunting knives? If so, please let us know in comments. Best Waterproof Roll Top Backpack: Keep your Gear Dry and Enjoy Yourself!